Book Synopsis: Within 20 pages, I was absolutely in love with the characters and the plot. Rachel and Mycroft connect because they’re both struggling to find out where they belong in a world that doesn’t understand them. At first I wasn’t too convinced that I’d love Mycroft as much as I did. He was witty and outgoing, but as a romantic lead, he wasn’t convincing – perhaps that’s because this book is written from Rachel’s point of view, and she doesn’t think of Mycroft as anything more than a friend… until later, at least… It was towards the end of the book that the romance ignited into a dazzling flame. But the thing I liked about this book was that the relationship between Mycroft and Rachel never seemed forced, only a little awkward and teenager-y at times. And the romance between them wasn’t put there simply to attract more teenage girls to keep reading; it was an important part of the book that really showed how much Mycroft and Rachel needed each other. The main part of this book was about solving a murder. Be warned, this book is a little gruesome in parts, but nothing too horrific. 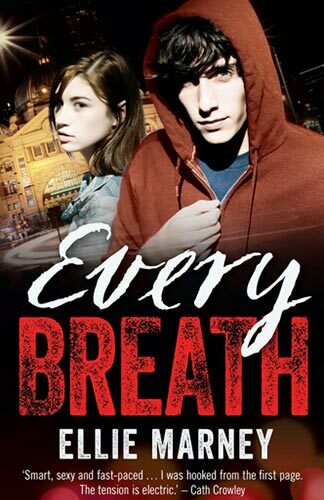 I loved reading Every Breath by Ellie Marney and I can’t wait to read the next book in the series!